David Bender, from the Nevies clan, great great grandson of Freda Yona and Naftali Ivianski, has built the most amazing family tree which shows the family links all the way back to King David, through the Maharal and Rashi, and lots of other interesting links. The tree has been put into Acrobat PDF format so all you need is the Acrobat Reader to look at the tree on your Computer - Click here to load and you can save it to view offline. If you cannot get this to work, then I can send you the file by email in Acrobat PDF format. David is happy to have family members share the tree and if you contact me at webmaster@frumkin.org.il I will send you the file. On File - I can provide either a Gedcom format file or Family Tree Maker file. But you need a Family Tree Program of some sort to look at the Family Tree. 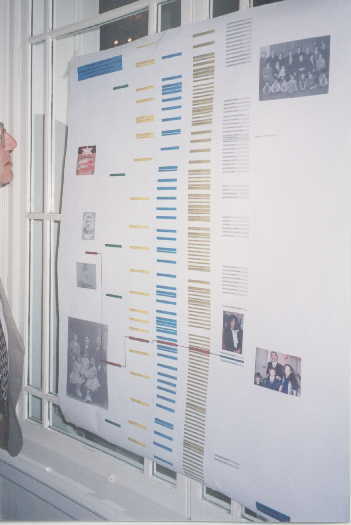 As a Chart - Opposite is a picture of a chart printed for James Duboff's Bar Mitzva. The chart shows all the descsendants of Arye Leib Frumkin (there is another chart even larger with all the descendants of Freda Yona and Naftali Ivianski). 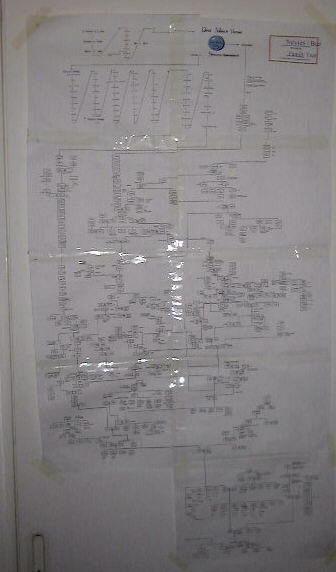 I prepared the chart using a program called Superchart which comes with a family tree program called Reunion. I then printed it out on an HP 650 plotter at a technical drawing office. If anyone is willing to try I could send them a file in HP650 format to try to print out locally. Margalit Normend has requested that we update the family tree listing at Bet Hatefuzot in Tel-Aviv. This has been done in May 1998 (we submitted a diskette in Gedcom format).The Frumkin family is listed as Family 29. The information is available to visitors to the museum, towards the end of the tour at the Dorot Department. It makes sense to update the information in the Bet Hetefuzot database about once a year. To each name within the database we can add dates (birth/death), occupation, religion, emmigration, and up to 5 lines of notes.